As radiation from the sun passes through our atmosphere, all of the UV-C radiation and around 90% of the UV-B rays are absorbed, mainly by ozone and oxygen. However, most UV-A radiation reaches the planet’s surface since it is not absorbed as it passes through the atmosphere. This means the solar radiation reaching Earth is mainly UV-A with a very small amount of UV-B but when levels of ozone are depleted, this allows more UV-B radiation to reach the planet. Levels of UV-B vary according to a number of factors including the time of day, your geographical location and the time of year. Obviously, more UV radiation reaches the earth in hot countries which get stronger sun and the levels fall towards the poles. The level of radiation is also affected by clouds and air pollution which absorb or disperse some of the rays. 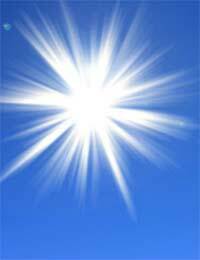 The time you are most at risk is around midday in summer under clear skies with the sun directly overhead. Areas of higher altitude have thinner air and the atmospheric pressure is lower. This means higher levels of UV radiation – typically 10-20% higher for every kilometre of height although this can vary significantly due to local conditions, reflections and the angle of the sun. Snow, ice and sand also have an effect on UV radiation because of surface reflection and since snow is often found at higher altitudes, the danger can be greater. The levels of UV radiation for skin to burn are described through a solar UV index (UVI). This starts at zero and the higher the number, the higher the risk - and the less exposure time is needed for sunburn to occur. The index was first used in Canada and was set to reflect a value of 10 in the south at midday. This is extreme heat and those with fair skin can suffer skin damage in less than 15 minutes when the UV index is at 10. The index has no upper limit – in some parts of South America, the level can exceed 25. Often, the UV index figure is shown on TV weather maps, with the number inside a warning triangle. In the UK, the UV index on a clear day in summer reaches around 7 at midday but it rarely goes any higher than this. From October to March, our levels are normally below 3 so there is little danger of skin damage, even for fair skinned people. People born with naturally brown or black skin have much greater protection from UV rays due to higher melanin pigment in their skin cells. This means they are much less likely to develop skin cancer caused by UV rays but experts say it still makes sense to reduce the risk even further by taking precautions in hot sun.